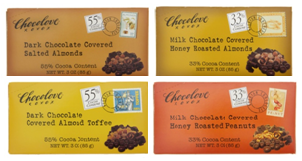 Chocolove makes premium chocolate bars. We buy premium Belgian chocolate. Our chocolate factory in Boulder, Colorado follows the classic European traditions of making chocolate in the mountains. Crisp, cool, dry air is one of many secret ingredients that we use to make the best chocolate. Chocolove is the best tasting chocolate for sale. Chocolove is made in over 20 flavors ranging from high cocoa content dark chocolate like Extreme Dark 88% to our decadent milk chocolate with toffee and almonds.